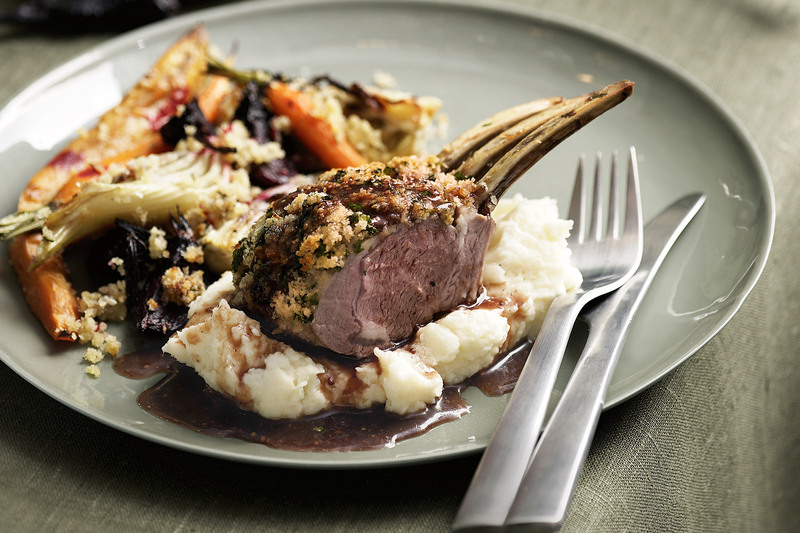 Impress your dinner guests this weekend with our roast lamb with rich cabernet sauce. Combine the breadcrumbs, parsley, lemon thyme, lemon rind and half the oil in a medium bowl. Season with salt and pepper. Whisk the stock and cabernet paste in a small saucepan over medium heat until the paste dissolves. Simmer for 5 minutes or until the sauce reduces slightly. Stir in 2 tablespoons of the mustard. Season with pepper. Preheat oven to 200°C. Heat the remaining oil in a large roasting pan. Add the lamb and cook, turning occasionally, for 5 minutes or until golden. Transfer to a plate. Season with salt and pepper. Spread the remaining mustard over the lamb. Press the breadcrumb mixture firmly over the mustard to coat. Place in the pan. Roast for 20-25 minutes for medium or until cooked to your liking. Cover with foil and set aside for 10 minutes to rest. Place the sauce over low heat and stir until heated through. Cut the lamb racks in half and serve with the sauce. Make it ahead: Prepare to the end of step 2 up to 6 hours ahead. Store the breadcrumb mixture in an airtight container. Cover the stock mixture and store in the fridge. Continue from step 3, 45 minutes before serving.